The municipality of Argos-Mykines (48,188 inhabitants in 2001; 10,026 ha) was formed in the 2011 local government reform by the merger of the former municipalities of Achladokampos (Αχλαδόκαμπος, 654 inh. ), Alea (Αλέα, 793 inh. ), Argos (Άργος, 29,228 inh. ), Koutsopodi (Κουτσοπόδι, 3,575 inh. ), Lerna (Λέρνα, 3,042 inh. ), Lyrkeia (Λυρκεία, 2,901 inh.) Mykínes (Μυκήνες, 3,388 inh. ), and Nea Kios (Νέα Κίος, 2,778 inh.). The emblem (image) of the new municipality was adopted on 19 April 2011 by the Municipal Council (Decision). 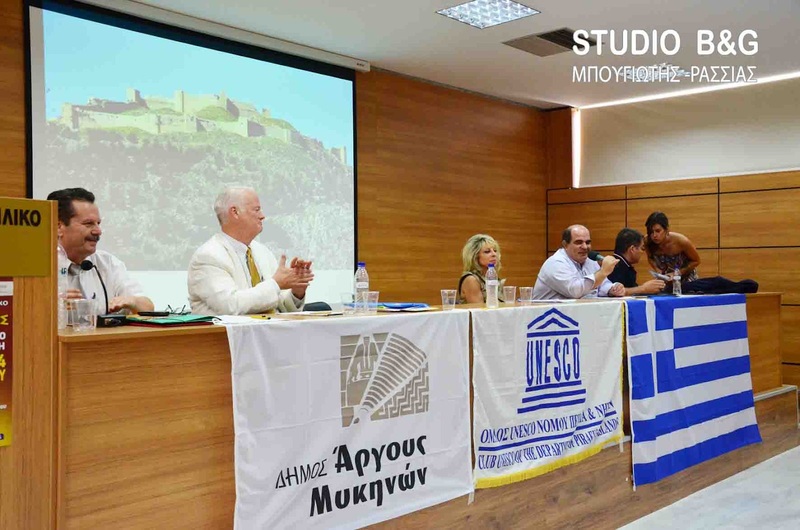 - the logotype "Municipality of Argos-Mykines", in Greek. The font was created by the very well-known engraver Tákis Katsoulídis. It has classical elements but also modern one because present times must also be given their "part of significance". On the flag (photo, photo), the stripe at the hoist "consisting" of several of these linear patterns from the emblem makes the difference from the earlier version of the flag (photo). Árgo is 11 kilometres from Nafplion, which was its historic harbour. A settlement of great antiquity, Argos has been continuously inhabited for the past 7,000 years, making it one of the oldest cities in Greece and Europe. At a strategic location on the fertile plain of Argolis, Argos was a major stronghold during the Mycenaean era. In classical times Argos was a powerful rival of Sparta for dominance over the Peloponnese, but was eventually shunned by other Greek city-states after remaining neutral during the Greco-Persian Wars. Numerous ancient monuments can be found in the city today, the most famous of which is the renowned Heraion of Argos, though agriculture (particularly citrus production) is the mainstay of the local economy. (Wikipedia). 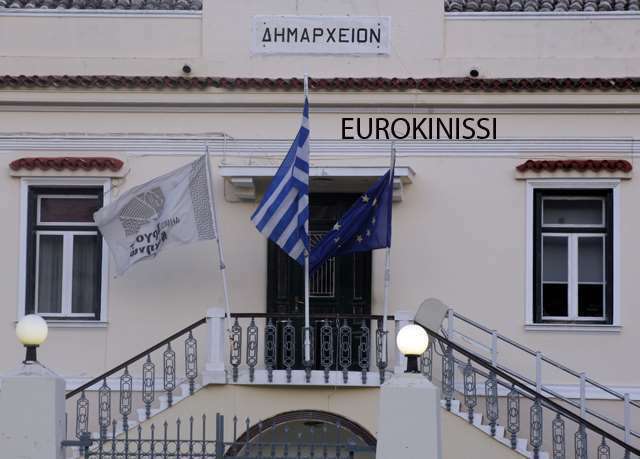 The former flag of Argos (photo; Kokkonis website) was light brown with its seal, showing a wolf's head (description), and the name of the municipality in a semi-circle above. Nea Kios was founded by refugees from Cius in Bithynia after the expulsion of the Greeks from Asia Minor. 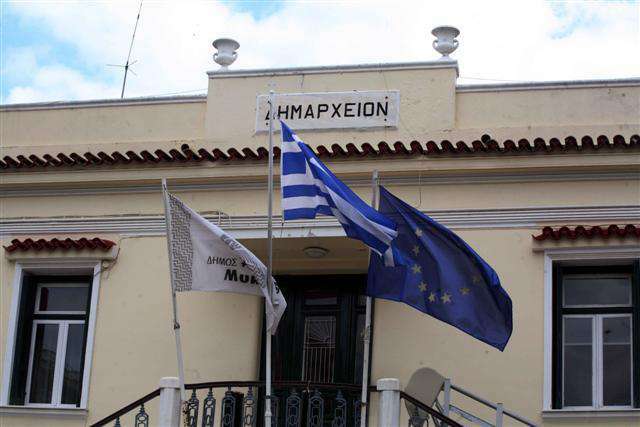 Its flag (photo, image) was white with the municipality seal, in blue, and name below: "ΔΗΜΟΣ ΝΕΑΣ ΚΙΟΥ".